The TANDEMKROSS �Victory� Trigger for the Smith & Wesson SW22� Victory� is the ultimate SW22� trigger upgrade - ideal for speed shooting competitors! 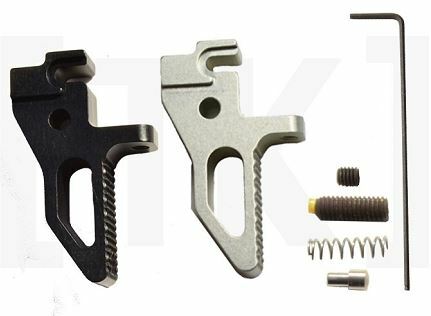 The TANDEMKROSS �Victory� Trigger removes nearly all pre-travel upon installation, and comes with pre- and post-travel adjustment screws to allow each shooter customize their SW22� trigger upgrade. The skeletonized, lightweight design of the TANDEMKROSS �Victory� trigger provides a flat face that allows the shooter to pull straight back and makes it easier to tell if they are pulling too far to the left or right. In addition to actually reducing the trigger pull weight by up to .5lbs, the flat-faced design also allows the operator to place their finger lower on the trigger, increasing leverage and giving the perception of an even lower pull weight. The textured SW22� trigger provides a no-slip surface regardless of speed or weather and allows for short, repeatable, identical trigger pulls. The trigger is made from aircraft-grade aluminum to be lightweight and durable. Available in either black or silver finish.